It feels like my throat and I have been at war for the longest time. I have had bouts of tonsillitis for the past few years, at least 4 to 5 times a year. It is frustrating and when it gets bad, the tonsils end up infected and then send their infection around via my blood stream. Fun times…. Until then I will keep drinking a little drink that I like to call my lemon ginger winter tonic. It is very soothing for the throat. All it contains is lemon juice, fresh ginger, honey and hot water and I thought I would share it for the cold winter ahead. It is a lovely drink even if you’re not sick. The lemon juice aids in decreasing dehydration, has vitamin C which assists in promoting and protecting the immune system. 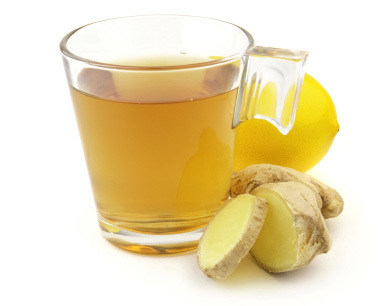 Ginger is used in many asian countries steeped as a tea to help with the common cold and flu. Ginger has been shown to reduce free radicals and promote gut health. Honey apart from tasting nice and being a good sweetener, has been used in Ayurveda (indian medicine) for 4000 years to rebalance the body. In more recent years honey has been proven chemically to have antibacterial and antiseptic properties. You’ll need the juice of half a fresh lemon, 1 teaspoon of finely grated fresh ginger root, 1 tablespoon of honey. Pour over boiling water… Wait to cool a little and drink. Personally using fresh lemon, ginger and good quality honey is a must, I also love to eat the ginger at the end of the drink as it has been cooked by the boiling water and I think that it gives me an extra boost. You can adjust the amounts of each to suit your tastes, but remember the sugar content in the honey! Ok, so I am not going to write out the whole recipe for this one (see link below), but trust me this is delicious, warming and perfect for the cold Aussie winter ahead. I woke on Monday to a rainy day… and hoped that the rain would clear in time for my double outdoor personal training group sessions that night (it did mind you). On seeing the weather I thought I could do with a hearty casserole when I got home, and didn’t fancy the idea of cooking at 8pm Given that I was going to be training for 2hrs I needed something I could put on at low heat for a few hours and come home to a warm hearty meal. Jamie’s sticky lamb stew was first made for me by a friend last year – and the flavours were so amazing, the meat so soft I fell in love. I do a few things different to Jamie. I use vegemite instead of marmite. I use a whole stubbie of stout (Guinness), and the same amount of stock (so a little more liquid). I also just use 2 large whole carrots, and chop up whatever mushrooms I can get. I used a brown onion this time in place of the red. For flavour and to keep cost down instead of cubed lamb, I like to use shoulder chops that have the little round marrow bone in them, once slow cooked the meat just falls apart, and the marrow – yum! But here are my 2 top secrets on modifying Jamie’s recipe. 1. I use my enamel covered cast iron pot to slow cook it in my oven. I brown the meat, add everything on the stove top and get it simmering away as per the recipe, but then I put the pot with lid on in the oven on about 160 Celsius for 2 – 2.5 hours. 2. At the end of the cooking I pull it out and add a couple of tablespoons each of honey and Worcestershire sauce. I do this to taste. Testing the sauce to make sure that it is not to sweet or savoury. It is just something that I feel gives it a little more depth in flavour. P.S I know the chippolata sausages sound weird but they are awesome in it, I only used about 8 as they were a little bigger and just threw them in I did not skewer them. 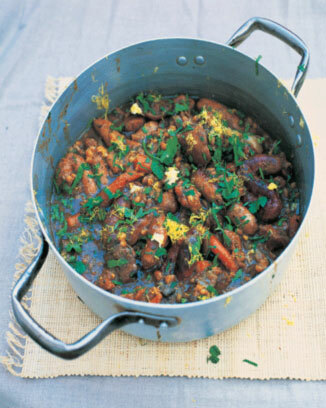 dark, sticky stew | Jamie Oliver | Food | Recipes (UK). I love a good piece of pork on my fork… Pork is a meat that I find tasty and with many of the new cuts today being very lean, makes this meat a winner. I brought a piece of Pork Loin and wanted to make something quick and easy and what cuisine is quicker than Asian. The good thing about this meal is the flavors are strong but not overpowering, the salad is fresh and crunchy from the bean shoots and the pork is warm and tasty. Being off work for the past 6 weeks (one more week left) I felt like a twist on making my own style Asian salad. 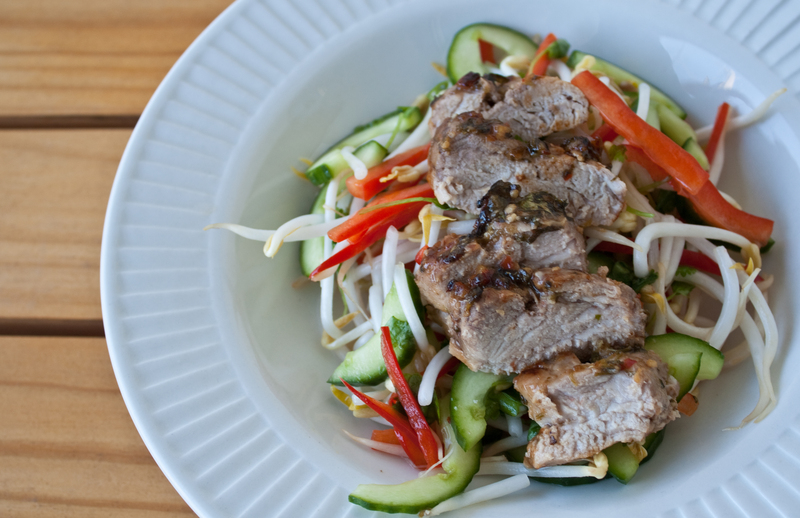 It is inspired by a Vietnamese dish called Bun – a type of cold rice noodle salad with warm lemongrass grilled pork on the top and dressed with a sugar chilli sauce. The marinade measures depend on you, how much you use depends on what heat level or garlic level you like. Combine to your own tastes (checking and rebalancing if needed) I cover the pork in it and let this sit for around 15mins (or longer for a more intense flavor). Pan fry pork on each side till sealed and brown then transfer to a oven safe dish to cook in the oven for 20mins at around 180C. Let rest for 5 mins then slice and serve on the bed of salad. The salad is very simple, but very tasty. Half Lebanese cucumber deseeded and sliced thinly. 1/4 of a Red or Yellow Capsicum (Bell Pepper) (green doesn’t have the sweet flavor needed) cut into thin short batons. Again this is to my tastes, once combined, rebalance to your liking, pour over salad. Vegetarian Option – Use firm tofu instead of pork – simply slice down the centre cover in the same marinade and then pan fry in a little sesame oil till sealed on each side and warmed through. That is it, simple quick dinner, with no carbs and very filling. Jamie Oliver is fun to watch and has simple recipes to follow! His food pops with flavour and is like a party for your taste buds. So when I was banged up in hospital recently I managed to catch an episode where he made steak sandwiches, crispy potatoes, a simple beetroot salad and what looked to me like the most mouth-watering mushrooms ever. Seriously when I saw this episode of 30min dinners I was about a week into eating hospital food and my taste buds started tingling. I haven’t had a chance to make the sandwich, potatoes or salad yet. But I have cooked the mushrooms a few times. And I make it even simpler than Jamie – His recipe is here check it out. I used some a little chilli (from the tube variety), garlic and 1 tsp of olive oil per mushroom and mixed together in a bowl. Spooned evenly into the mushrooms and topped with cheddar. Banged them in the oven for 30mins while everything else cooks and oh i just I used flat BBQ mushrooms, but have also done it with bigger button mushrooms when they didn’t have the BBQ ones. 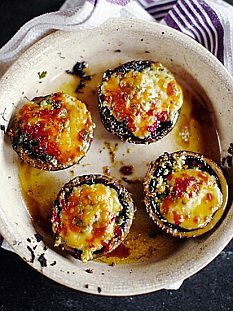 Seriously get on this recipe, it is an easy side for dinner with a taste explosion or could even be served as a quick entrée or appetizer – Oh and remember that you could always make a couple of mushrooms per person and replace the meat in the meal! In the Summer Time when the weather is Fine, you’ve got salad, you’ve got salad on your mind! Well Hey I have salad on my mind… and there is no salad like a salsa when it’s hot. On Monday night I was cooking for a friend at her place, so I needed something quick, easy, and tasty.. I had made this a month or so ago and posted a photo on FB, Jules liked the photo so I thought I would cook it for her. I love the idea of different types of Salsa’s. A good Salsa is fresh with a zing. 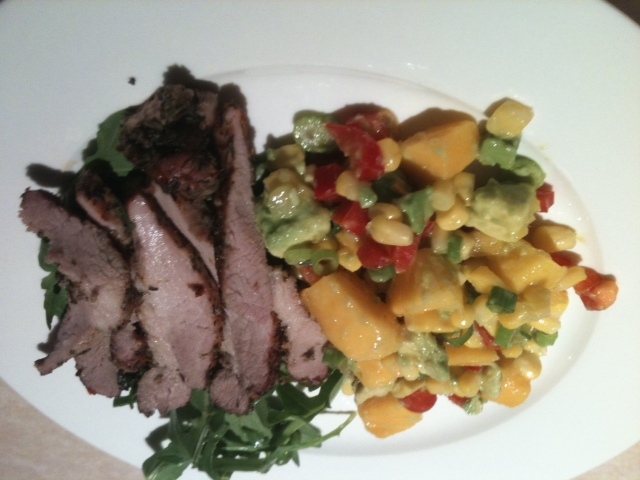 In this case the mango and avocado work together with the crunch of corn, capsicum and sping onions, the Zing was proudly brought to you by the juice of Lemon and Lime… All the players came together to form the prefect accompaniment to the oven baked (slightly spicy) pork. You could use other Pork, like a cutlet and marinate it yourself… Don’t like Pork – You could also do the salsa with lamb or chicken. If you are vegetarian or vegan – tofu would be nice (you could rub a little chilli and lemon on it and pan fry it quickly) add a few cashew nuts to the salsa too. Just make the salsa before quickly pan frying your tofu! The alternative to cooking in the Oven is the BBQ. I like the Oven method it makes it juicy – the BBQ will do the same if you are a good BBQer – and the trick is again to seal it on the BBQ and then turn it down to cook slowly and not burn or dry it out. Now onto the Salsa – While this is cooking in the oven, I grab a big bowl and put the following in..
1 Mango – slice off the cheeks, then cross hatch and scoop out of skin with a spoon, chop other bits off the mango as you can (before hitting the stone) into cubes. 1 Avocado – Halve lengthways and then take stone out (with a sharp knife hit the stone, twist and it will pop out) then cross hatch each half and scoop out with a teaspoon. Juice of 1/2 lemon & 1/2 Lime (or a full lemon if you have no lime) this is important for zesty flavour and also to stop anything from browning. Stir it all together gently, the avacado may breakdown a little but will add to the citrus dressing. I put a little crack of sea salt over it too. All ready to go! So when the Pork is cooked I let it rest for a few minutes before slicing it, plate the pork with some rocket leaves (for a peppery flavour) and the salsa – I use the salsa as a bit of a condiment with the pork… Very tasty and ready in around 35mins – Love Summer! This is quick and If I can say so myself tastier than take away! Carbs kill me, I love them – but they don’t love me. I don’t find eating bread, rice or pasta easy, it is a band thing – but that is not the full story. Carbs are a good fuel, but your body has to burn through them first and if they don’t get burnt, they get stored very quickly. There is also the role that Carbs play your blood sugar, insulin levels and the way our bodies store and use fat.. I am no an expert on this, I am still reading about it and learning more, but for the time being I am eating low carb and have found that the protein I eat fills me quicker and keeps me fuller for longer. 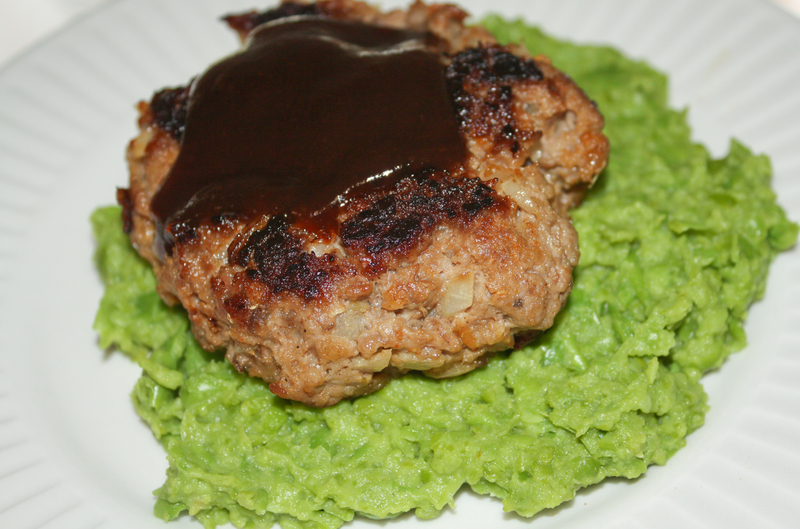 So today I felt like a burger – but did not want the bread or mash potato that I used to love with a burger due to the carbs… So I made some mashed peas with it. 1/2 teaspoon of taco mix powder (more or less depending on your own tastes). Mix it all together and form two patties (one for today, one for tomorrow) If they aren’t staying together you could pop them in the fridge for a bit or add a little almond meal to keep it carb free and not use breadcrumbs. Spray a frypan and seal each side before lowering the heat and cooking through. The mashed peas was simply popping your desired amount of peas 1/2 cup for me for one serve into salted boiling water, boil until soft (about 15 mins) then drain, and mash with a small knob of butter and salt and pepper to taste. I like to pop a little BBQ sauce on top of the burger and use the peas as a bit of a sauce too! It was very tasty, although the photo above doesn’t really do it justice. The taco seasoning just gives it a little extra flavor without being hot (as I only use a little).